Saturday, I was craving a salad (that’s a thing), so I got my lettuce out, put it in a bowl and thought I saw something funny. Although the lettuce appeared just fine, it had a light gray mold on it. I tossed it, and was sad. Then I was inspired to still make a cold salad with vegetables on hand. What I ended up with was fabulous, and, incredibly easy. I’m always looking for veggie change-ups. Mix everything up and serve 🙂 I just ate the leftovers for lunch and it tastes even better! 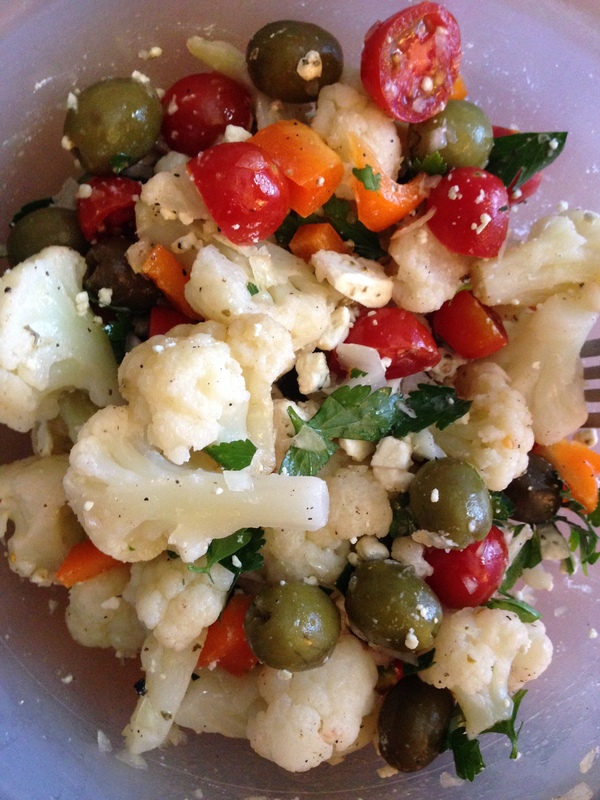 This entry was posted in Recipes and tagged Cauliflower, Chilled Cauliflower Salad, Flat Leaf Parsley, Olives, Onion, Orange Bell Pepper, Primal, Tomato by livinglikelinds. Bookmark the permalink.